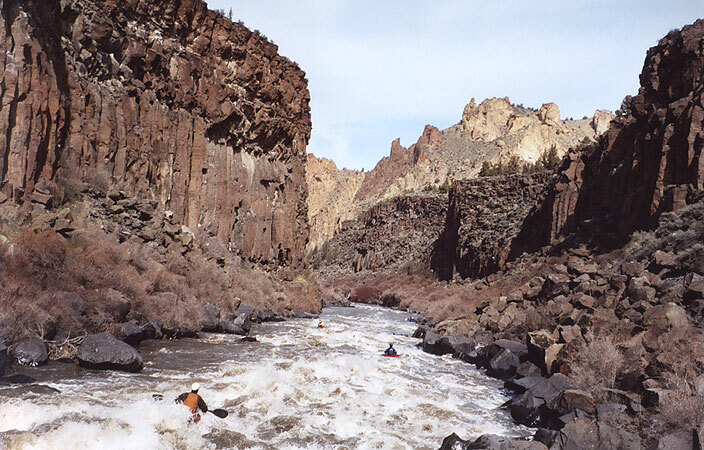 The Crooked River Canyon section is one of Oregon's few 'turn on' runs, a totally dam-controlled section of river that rarely has enough water to paddle. 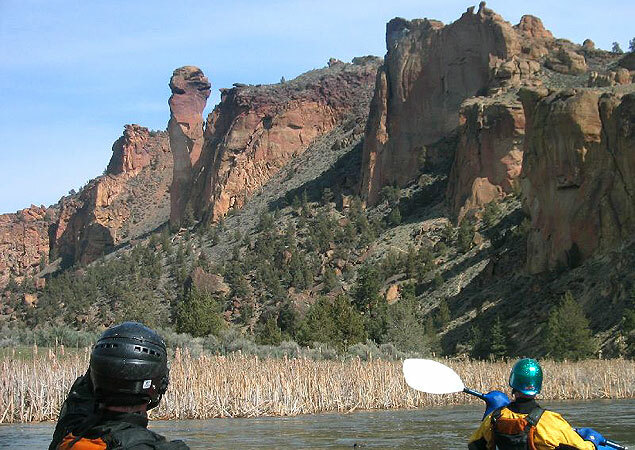 There are no scheduled releases on this river, so paddling this 18-mile section is a frustrating hit-or-miss proposition depending entirely on fickle snowpacks and the damkeepers' whim. 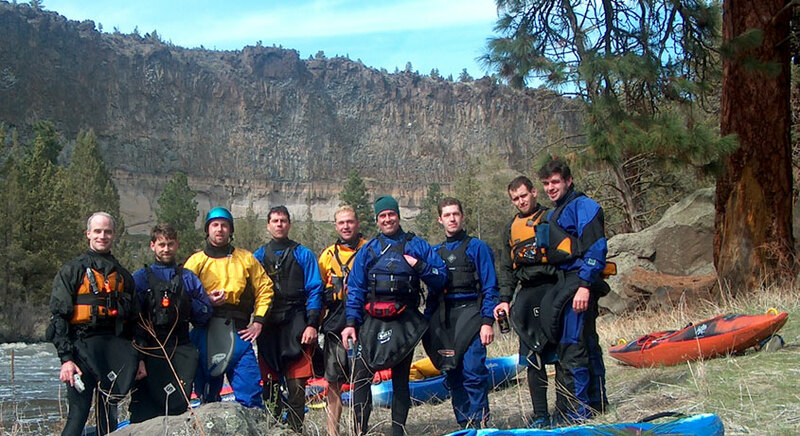 It is unfortunate that this river runs so infrequently because it flows through one of Oregon's finest desert canyons, with spectacular scenery and some great whitewater between the long, flat, scenic sections. A few years back my friends headed over to run the Crooked and I had other stuff going on. I remember thinking: "Oh, I'll just go next weekend..."
Three or four years later I was still kicking myself for not running this river while I had a chance, because the following weekend the dam was shut off and the river hadn't run since, at least not that I know of.. So, in the Spring of 2004 when the call went out that THE CROOKED IS RUNNING every paddler who was 'in the know' headed over as quick as they could.. "Who knows how many years it will be before it runs again on a weekend?" was in the back of everyone's mind.. That thought was definitely on my mind, because I learned the hard way that runs down the Crooked can be few and far between! 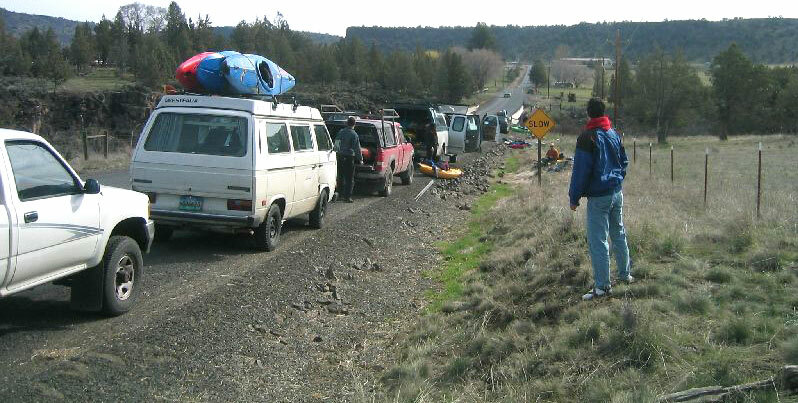 Rush hour at one of the Crooked River put-ins: Pete Giordano checks out the parking situation. 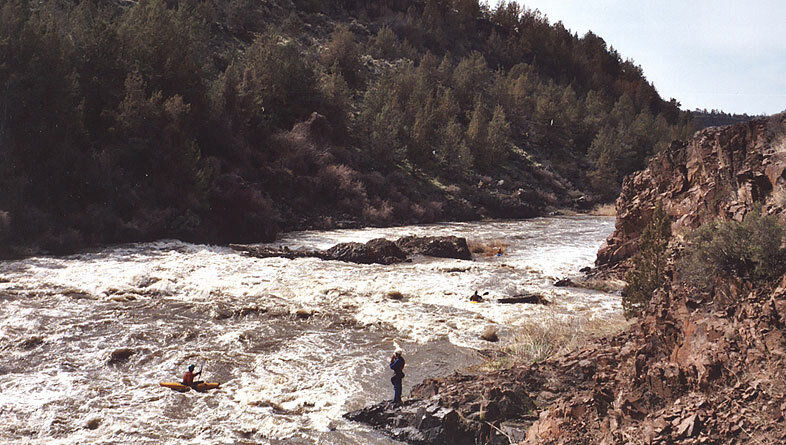 photo by James Bagley Jr.
Below the put-in the river is pretty flat for the first mile or so, then it enters a super-fun class III-IV section of rapids that lasts about a mile. This is great stuff, all point-and-shoot, right down the middle.. The author (black helmet) reminisces about climbing the 500-foot tall monolith known as Monkeyface (background) back in the good ol' days. Yep, those were good times, back before I became a kayaker and my climbing gear went in the closet, never to be seen again..
Once past Smith Rock we were soon confronted with an impressive horizon line, marking the first of the 'real' whitewater on the Crooked, a rapid known as 'Number One'. Number One is a pushy, splashy dash down the right to avoid a stomping river-wide hole halfway down. The idea is to ride the tongue through the right side of the hole, which is the weak side. We had caught up to another group at this point, so we got to watch their last guy clean the drop, then Gabe Flock from our group also ran it cleanly. 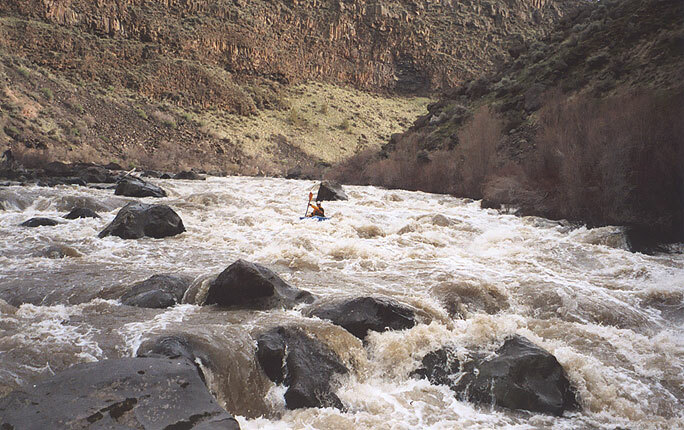 At this point the rest of us were scouting and Jesse was sitting in the eddy upstream, getting psyched. After receiving some verbal beta on the drop, Jesse peeled out of the eddy and charged down the left side, right into the biggest, baddest part of the hole..
What followed was one of the most impressive rides I have ever seen somebody take in a hole without swimming out of it.. Ladies and Gentlemen, put your hands together for.. THE HIDEOUS HOLE IN RAPID NUMBER ONE vs. JESSE 'THE HOLE DADDY' COOMBS ..
And now please welcome our announcer for this evening's fight, Carry Carnaaage!!! Laaaadies and Gentlemaan, In the blue forplay corner we have Jesse 'The Hole Daddy' Coombs, recently back from a 40-day paddling epic in South America where he knocked out several heinous class six rapids including two 45 footers!! Let's hear it for Jesseee the hole daddyyyyyyy!! Alright gentlemen, let's make it a fair fight. Hole: No rootwads or logs are allowed to come downstream during the fight, and Jesse, no throwropes for you, ok?!? May the best paddling action figure win! Jesse comes out swingin', dropping dead center into the stomping river-wide hole at Number One.. ROUND ONE: It's hammer time..
At this point a crowd of paddlers had gathered and were cheering Jesse on.. go Jesse go!!! ROUND FIVE: C'mon JESSE!!!! Ride eerrrr YEEEE HAWWWW!!! ROUND TEN: Jesse still going strong.. "If I hang out long enough they'll shut off the dam and I'll walk out of this sucker.."
Downstream the river bounced through some more fun rapids before reaching 'Number Two' (whoever named these rapids must've left the Thesaurus at home that day or something..). 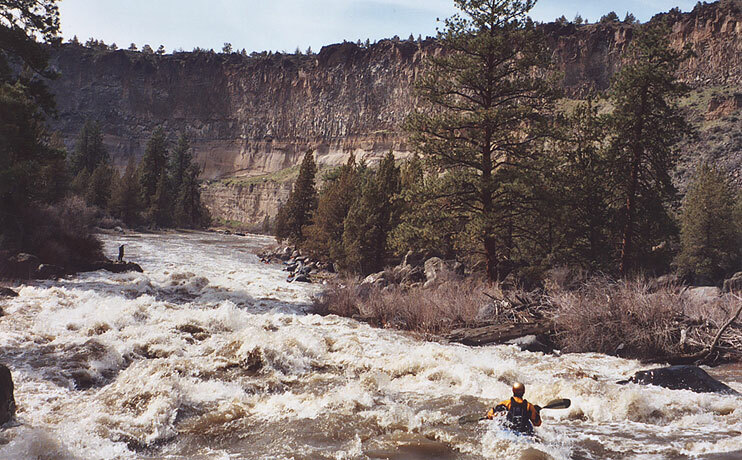 Number two (also known as 'Lava Island' ) is located on a long, gradual left bend in the river with a large rock outcropping on the right hand side. Number Two is actually a long, gradual double drop through two river-wide holes. Neither one of the holes are dangerous but the first one is fairly uniform and somebody swam out of it while we were there, so hit em' hard and try to stay straight.. We all ran the right side channel, though the left side looked ok too upon inspection. James Bagley watches as two paddlers run Number Two. The first paddler has just cleared the first hole and is heading for the bottom (surprise!) hole, located where the river pinches down on the right hand side. Next up is Wap-de-Doodle, a splashy, playful rapid that is located on a sharp left-hand bend in the river. This drop looks like it has a huge hole at the bottom, but it is just a monster wave that the river funnels down into, very fun stuff!! At this point we had caught up to two other groups of kayakers, so we got to watch about ten people run the drop before we did..
A paddler drops into one of the best rapids on the River, a long, splashy drop known as 'Wap-de-Doodle'. Below Wap is a great lunch spot under the shade of several large Douglas Fir trees, so we took a break and admired the incredible canyon scenery and waved at other boaters as they drifted by.. The Crooked River Gang at the lunch spot. Below the lunch spot the action picked up considerably, with lots of very fun class III-IV stuff. The canyon walls also tighted up a little, making this one of the most scenic parts of the river..
No Name is pretty easy to scout or portage on the right hand side, in fact there is a pretty well-worn trail down that side as numerous paddlers have trooped down the entire length of this 200-yard long rapid to ponder the enormous hole at the bottom. Jesse boat-scout-probes No Name Rapid. The big, burly hole is just out of sight in this photo and tends to surprise unwary paddlers who don't scout or know the line! James Bagley Jr. claws his way past the bottom hole in No Name Rapid, narrowly avoiding a hideous pounding. Three paddlers swam out of this hole the weekend we ran the river..
Below No-Name the river has more fun class II-III drops and more amazing canyon scenery. Soon the river takes a long, gradual bend to the left and drops over China Dam, which also marks the take out. China Dam is a very fun rapid which is run down the right hand side. 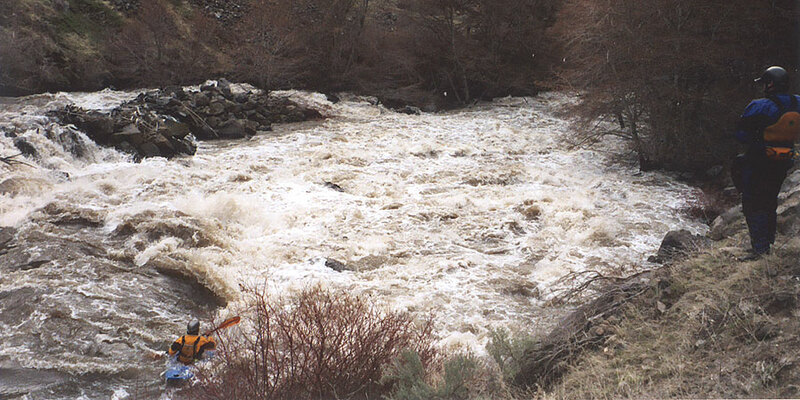 It should be noted, though, that there is a large hole at the bottom of this rapid that is obscured by the trees and therefore not visible while you are scouting the rapid. This hole is not as big as the one in No Name or Number One, though, and everyone managed to punch through it just fine in our group..
Jesse boat-scout-probes China Dam, a very fun rapid which also marks the take-out. Take out immediately below China Dam on the river-left side and begin the long slog up Hollywood Road to the parking area, or camp here and continue downstream the next day to the lake.